The Garden Continuum is seeking hard working individuals. Apply Today. Building a great team is not that different from building a great landscape. At The Garden Continuum, we design and plan for synergy, efficiency, and long-term success in our landscapes, with our clients, as well as with our staff and team culture. 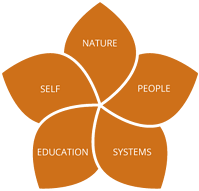 Our core values guide our success by keeping us aware of five critical elements that are central to all we aim to achieve: Nature, People, Systems, Education and Self. By aligning our awareness with these elements, we know that we are traveling on the path of good work made fun! We are passionate about what we do and are always looking for great people to join our team! Do you think that could be you? Complete the form to the right to apply today!